It was a speech at the Democratic National Convention in 2004 that put Obama on the national map, but, despite his oratory prowess, the president-elect is nervous about his inaugural address. Just hours after admitting he was intimidated by Abraham Lincoln’s second inaugural address, Barack Obama went to stare it down. He had set the weekend aside to work on his own inaugural speech at the Hay-Adams Hotel. By Saturday night, he was headed to the Lincoln Memorial, where the 703-word speech delivered at the end of the Civil War is etched on massive stone walls. With at least three drafts behind him, Obama is nearly done with his own speech, an aide said Thursday – striving for a tone that’s soaring but accessible, simple but inspiring, urgent and confident all at once. A competitive man by nature, Obama seems acutely aware that he’s stepping into the ring with history itself Tuesday – squaring off against not only the public’s expectations for a voice-of-God moment, but also against the addresses that came before his, the formidable and the forgettable. Those who know him say Obama may well strive to top them all. “Obama is the most eloquent presidential candidate since JFK and I would think we would hear the most eloquent speech since JFK’s 48 years ago,” said Theodore C. Sorensen, the Kennedy speechwriter on the 1961 inaugural address, which has rattled and inspired a half-century of presidents. 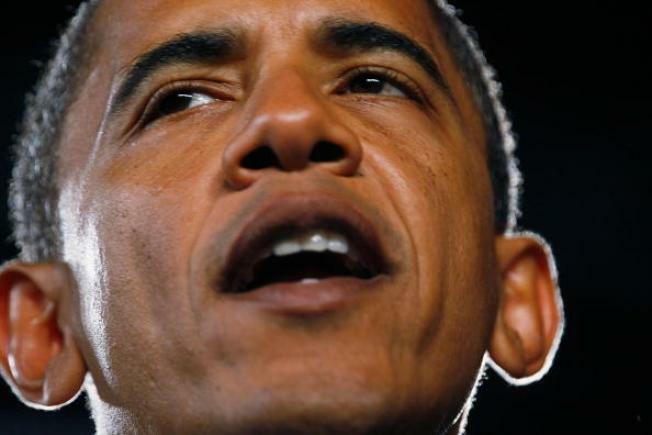 Facing a global economic crisis, two wars and some of the highest expectations for a presidency in decades, Obama faces pressure in this one speech that is enough to make even the supremely confident president-elect own up to some nerves. It’s the one speech that an incoming president can think about for months, unburdened by the pressures of campaigning. But only 43 other people in the history of the nation have given one, and with a second term not guaranteed, the first inaugural is a singular opportunity to set the tone for a presidency. The speech, which is expected to draw more than a million people to the National Mall, seemed to sit at the front of Obama’s mind last weekend. “The main task for an inauguration speech ... is to try to capture as best I can the moment we are in,” Obama said during an interview taped Saturday on ABC's "This Week with George Stephanopoulos." At the end of the Civil War, Lincoln spoke of unity. With the nation in an economic depression, Franklin D. Roosevelt sought to restore confidence. Feeding a renewed American spirit, John F. Kennedy ushered in the baby boom generation. “I have such confidence in the American people,” Obama said in an interview last week with CNBC. “If you just play it straight with them, if you explain to them, here's our challenge, here's how we've gotten here and here's where I think we need to go, then I have enormous confidence that the American people will rise up to the challenge. Obama is approaching this speech like he has others in the past, collaborating on the writing and editing but exercising the final say. The job this time rests primarily with three people: the president-elect, senior adviser David Axelrod and chief speechwriter Jon Favreau. The trio met a week before Thanksgiving to discuss themes. Favreau, who has worked with the president-elect since 2005, completed the first draft with his team of speechwriters in early December, working from different spots around Washington: the Starbucks in Penn Quarter, the transition office, and his condo. Obama, Axelrod and Favreau convened on a conference call the day before the president-elect’s two-week vacation in Hawaii to review the first cut. He received a second draft upon his return, and after a weekend of solitary writing and editing, Obama met Monday with Axelrod and Favreau to incorporate the changes. "The speech will describe the moment we're in and the spirit required to emerge from this crisis even stronger and more united than before," Obama spokeswoman Jen Psaki said in a statement. David Kusnet, a former chief speechwriter for Bill Clinton, said the former president went down to the wire on his speech. But it’s a closely held process. Despite being an early supporter from the Kennedy family circle – and renowned wordsmith himself -- Sorensen said he hasn’t offered advice to the president-elect or his aides. “To coin a phrase, or to borrow one from the Kennedy inaugural from 1961, they haven’t called me because the torch has been passed on to a new generation,” said Sorensen, 80.